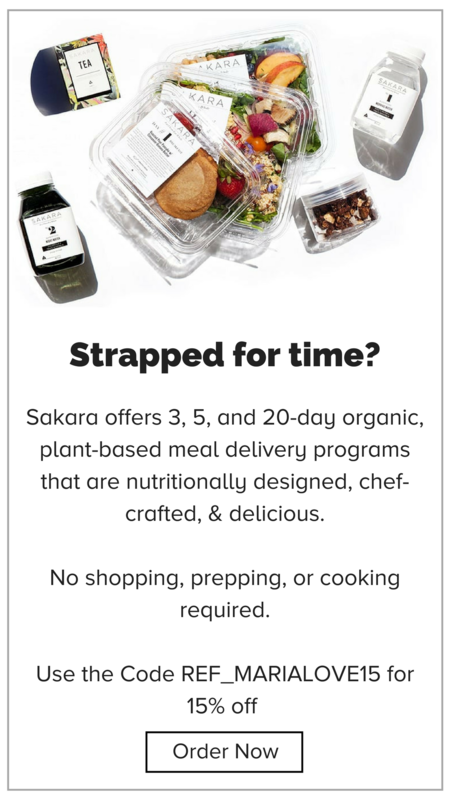 If you’re trying to eat more vegetables, there are two gadgets that will make your goal infinitely easier: a Vitamix and a Spiralizer. 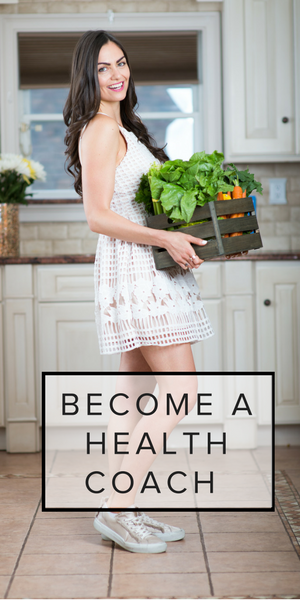 I’ve talked about my love/obsession with my Vitamix before, so now it’s time to give the spiralizer the spotlight. 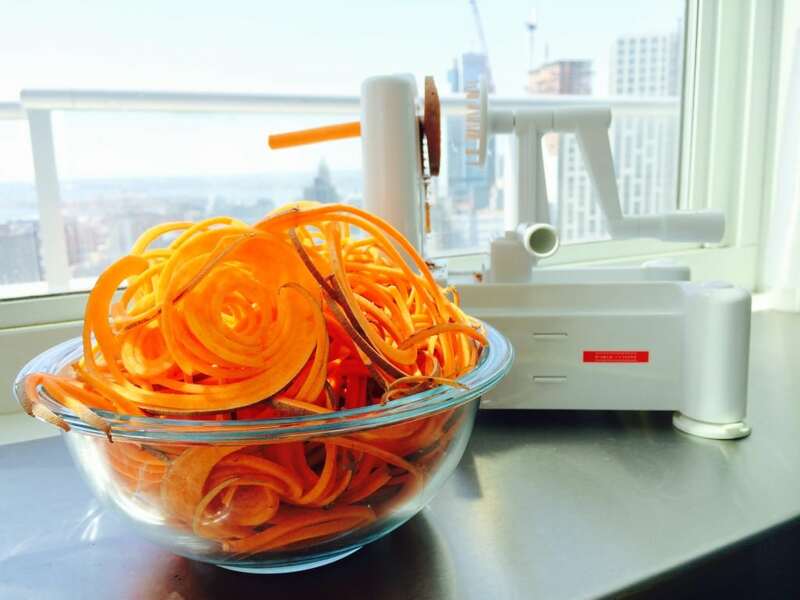 The spiralizer was a gift from my client, Mary Jo (thank you and love you MJ!) and I must say, it’s one of my favorite things to use. 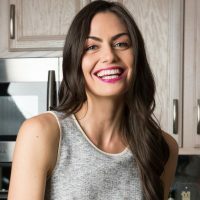 When I first got it, I was hoping to make crispy sweet potato fries by baking the long curly strings it produced…but nope, instead when I baked them, they came out like spaghetti, which turned out even better! 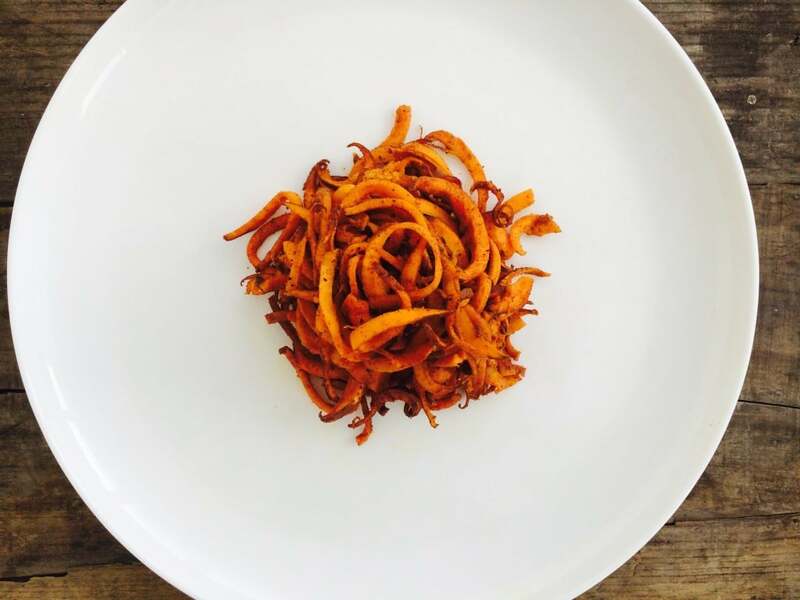 Spiralized sweet potato is officially now my favorite way to eat the vegetable. 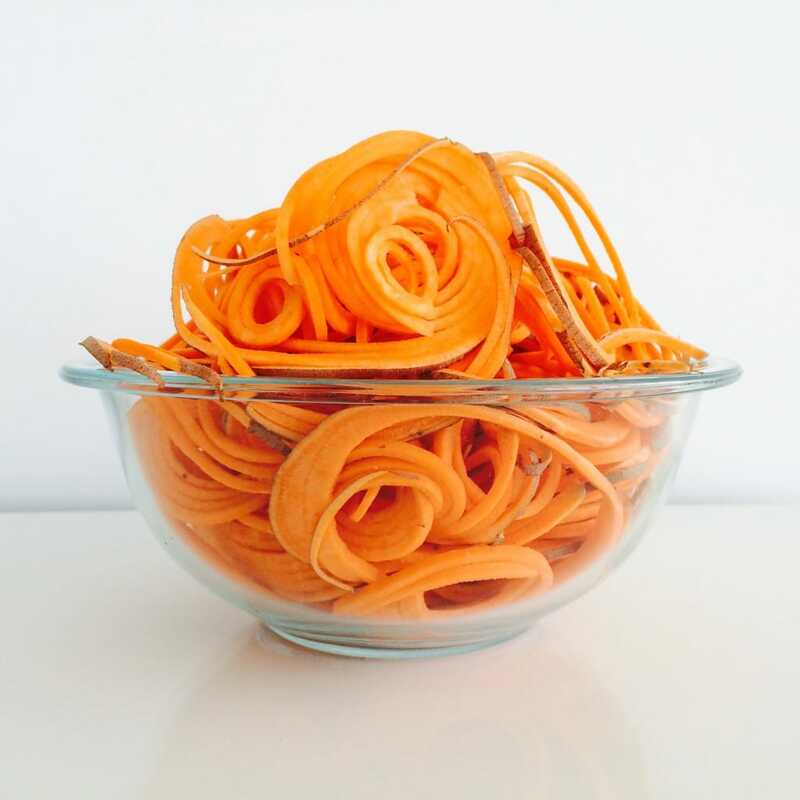 I make these spiralized sweet potato noodles at least once a week. I’ll usually pair them with this kale and avocado salad or a Hilary’s Eat Well Veggie Burger (aka the best veggie burger, ever!). At a dinner party Sunday night, I used them as a side to 5 spice salmon. Did you know? Sweet potatoes are not at all related to “regular” potatoes. 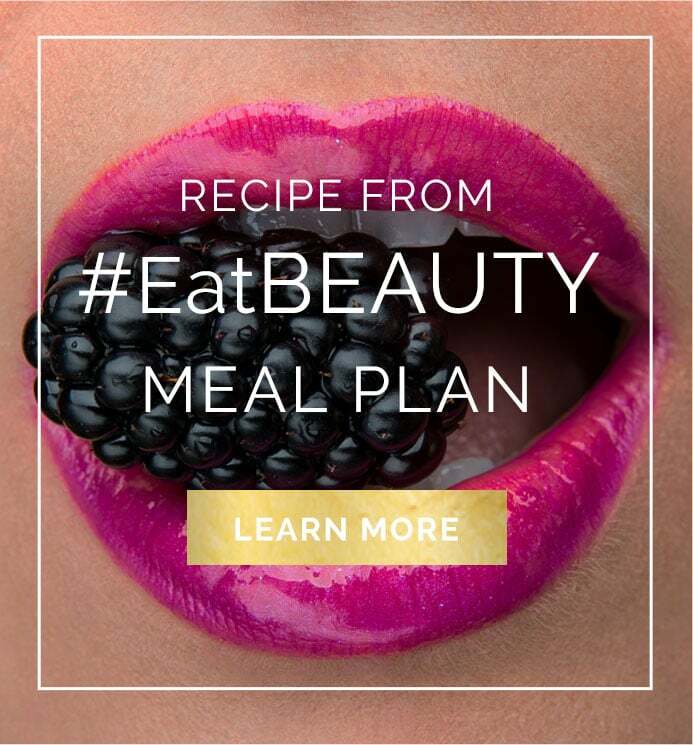 They are rich in a variety of vitamins and minerals, in particular Vitamins A, C and B6. Even though they’re “sweet” they are still a healthy choice. 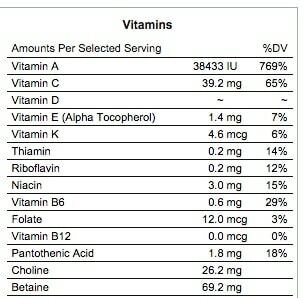 Just look at all the nutrients in just 1 cup of sweet potato… 769% of Vitamin A ?!?! 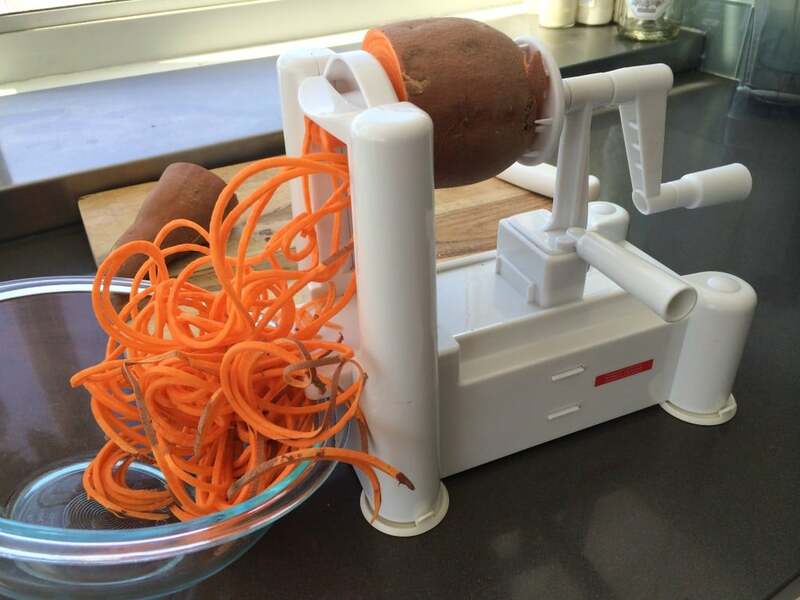 You essentially just put the sweet potato, or any vegetable, onto the spiky part, and then hand crank it through the blade to create beautiful strands of vegetable goodness. TIP: Find the fattest vegetables you can find… the wider the sweet potato, the easier it is to crank it through, and the better the noodles. One thick sweet potato made that whole bowl of noodles! You can see in the background, it leaves you with a long cylindrical piece and essentially a chip.. I always cook those too, no need to throw them out! Here is what they look like baked with all the delicious and aromatic spices. Ta da! Sweet potato spaghetti. Best thing since sliced gluten-free bread. 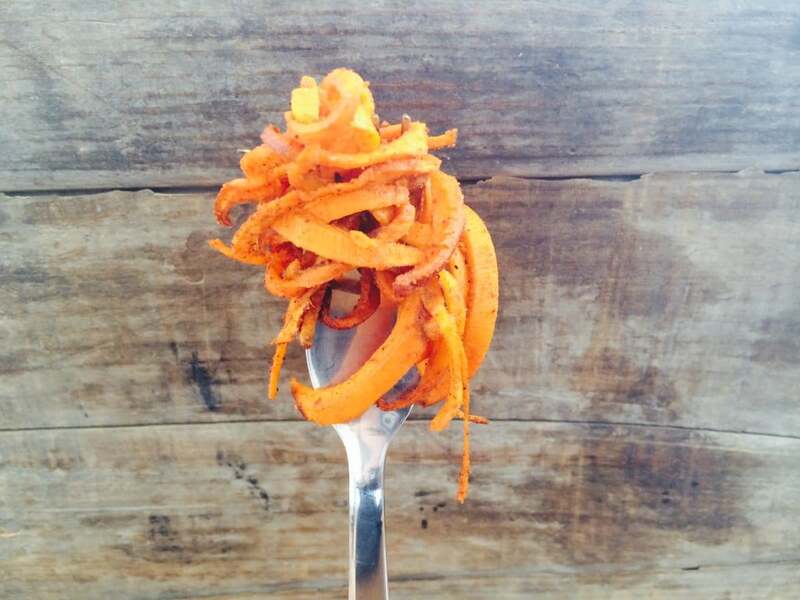 Spiralize the sweet potato into a large bowl. Dress with oil and spices, and toss well until thoroughly coated, then spread out as flat as possible on a baking sheet. Bake for 30 minutes, stirring halfway through. *Choose the widest/thickest sweet potato possible, to get the best spaghetti strands. If using an organic sweet potato, leave the skin on. 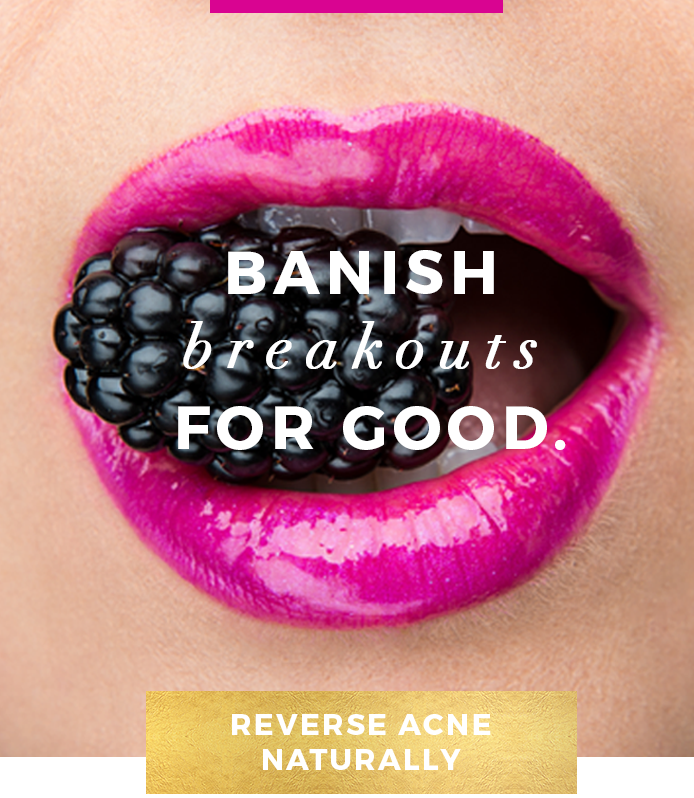 If non-organic, peel it.